A team of Rose-Hulman students has put sustainability and mathematics into practice, examining how the college could reduce its environmental footprint by reducing, reusing, and recycling food waste from campus dining centers. That cost savings could be substantial, estimated at $471.20 over the course of two days during a recent food waste campaign, and $11,781 for an entire 10-week academic quarter. The students' study has been featured at a North American mathematics conference, by Asian EngineerLive.com and on the Minitab blog. 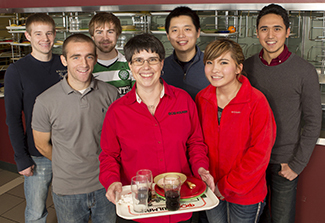 Diane Evans, PhD, associate professor of mathematics, saw the food waste problem as an ideal candidate for a Lean Six Sigma project that students could learn in her Statistical Methods in Six Sigma course. Her teaching methods were cited in The Princeton Review's 300 Best Professors book (2012) and as the recipient of the Dean's Outstanding Teacher Award (2007). Lean Six Sigma is a managerial concept combining Lean and Six Sigma that results in the elimination of wastes from defects, including overproduction, extra processing, non-utilized talent, and inventory. "I wanted my students to go through the process of completing a project from start to finish," Evans, a Six Sigma black belt, told The Minitab blog. "The food waste project provided students with this opportunity, and gave them a chance to put the skills they were learning in class to use in the real world." With Lean Six Sigma tools, 26 students set out to reduce the amount of food waste generated from Rose-Hulman's main campus dining room, located in the Hulman Memorial Student Union, during lunch. A July 2012 article in Food Policy reports that U.S. food waste on the consumer level translated into almost 273 pounds per person in 2008. Evans' students converted this number into pounds per day, and to determine the amount of waste per meal, they divided the figure by 2.5 meals per day (breakfast didn't count as a full meal because it typically does not see as much waste as lunch or dinner). The students ended up calculating an average food waste amount of 4.78 ounces per meal. Using this number as a standard, the class set out to reduce the edible food waste per student by one ounce per meal during the lunch period. With this goal established, the class began by learning more about the current dining center processes and food waste at Rose-Hulman. "Our aim with this project was to reduce food waste using standardized quantitative process improvement techniques," says Neel Iyer, a recent mechanical engineering master's degree graduate and a member of the project team. "Lean Six Sigma project tools make it easy to share the hard savings and prove results statistically, while also giving others a framework to replicate what we have done." After using Minitab software to calculate food waste measurements for lunch and dinner, students organized a campus awareness campaign to educate others about food waste. Posters, demonstrations, and seminars were conducted in the dining hall during lunch hours. They also suggested giving students smaller serving utensils for condiments, pre-dish more foods, and limit how many glasses and bowls of food or drink students could take per tray. A statistical analysis of food waste after the awareness campaign revealed a significant reduction of 2.66 ounces of food waste per person/meal. Because the dining hall typically serves about 875 students per day during lunch, Evans' class estimated that the food service operation could see a waste reduction of approximately 2,327.5 ounces, or 145.4 pounds during a single lunch period. During the 50 lunch periods in a typical quarter, a total of 7,270 pounds of food waste could be saved. And, since food waste costs $1.60 per pound ($0.10 per ounce) on average, the class came up with its food savings calculations. 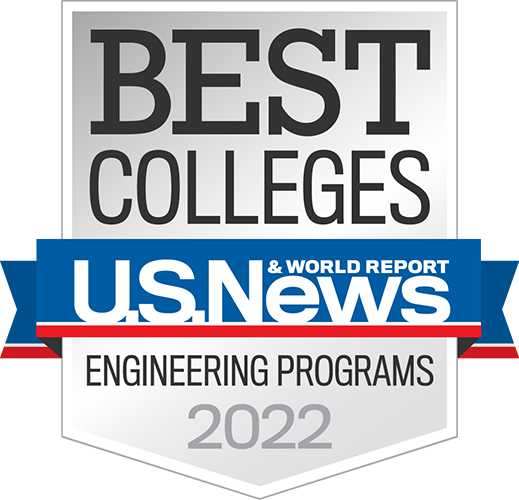 Although the improvement efforts were short-term, Evans and her students were proud to pass on their findings to Rose-Hulman's administrators. "The administration is proud as well, and they are showcasing the results," says Evans. "They see the value, and they're encouraging follow-up projects from the Six Sigma students."